Pazhayar, a major river flowing in Kanniyakumari district and source of irrigation for farmers in its vicinity has become polluted due to the draining of sewage and unmindful dumping of garbage. The worst stretch is between Ozhuginasery flyover and Suchindram as drainage is being let into it. 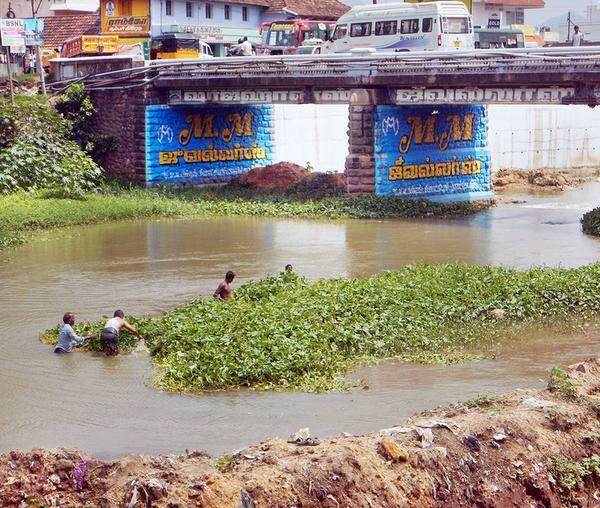 This has resulted growth of weeds such as water Hyacinth and it blocks the free flow of water. Pollution has prevented people living on its banks from using the river for their personal chores. The Nagercoil Chapter of INTACH has begun an initiative to clean the river with the cooperation of civil society, said its Convener R.S. Lal Mohan. Over 30 volunteers from Bhairavi Foundation, Aam Aadmi Party and Consumer Protection Centre have lent a helping hand to clean the river for about a kilometre from Suchindram Bridge to Ozhuginasery flyover, Dr. Lal Mohan said. He added that the cleaning process would be carried out every Sunday between 9 a.m. and 3 p.m.